Used with explicit permission from Fablevision. 21st Century Skills are so much more than being digitally literate. While learning to use technology is an extremely important skill for the 21st Century, we must look beyond how to use the tools to how you think, how to access information, ways of working in a globally collaborative world, and skills for living in a 21st Century world. 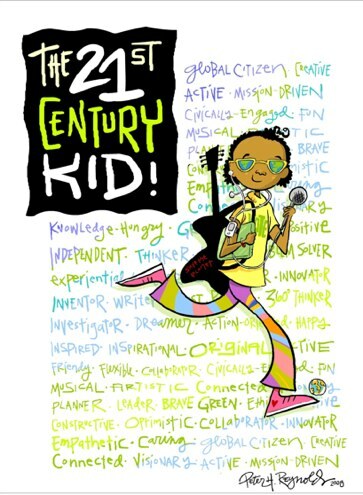 21st Century Skills should be infused into core curriculum in all classrooms throughout the school day. Teachers should promote, support and model creative and innovative thinking through technology-enriched environments. The use of digital tools emphasizes discovery through applying, finding, assessing, synthesizing and utilizing information. Teacher and student access to course content is enhanced by electronic sources within a media-rich environment. The team at US Digital Literacy develops and supports technology resources and professional development to enhance the teaching-learning process. Collaborative problem-solving. Working together to solve a common challenge, which involves the contribution and exchange of ideas, knowledge or resources to achieve the goal. ICT literacy — learning in digital networks. Learning through digital means, such as social networking, ICT literacy, technological awareness and simulation. Each of these elements enables individuals to function in social networks and contribute to the development of social and intellectual capital. is a national organization that advocates for 21st century readiness for every student. As the United States continues to compete in a global economy that demands innovation, P21 and its members provide tools and resources to help the U.S. education system keep up by fusing the 3Rs and 4Cs (Critical thinking and problem solving, Communication, Collaboration, and Creativity and innovation). While leading districts and schools are already doing this, P21 advocates for local, state and federal policies that support this approach for every school. Digital Literacy includes learning how to use technology’s tools. The list of digital tools is never ending. New releases make something that was new yesterday old today. Educators as well as students must thoughtfully determine which tools are essential to their digital literacy tool kit. Tool kit’s vary from one educator to another as they do from one student to another. Once you have mastered a particular tool, move on to another so you can increase your digital power.